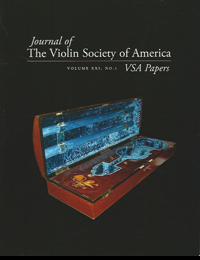 The VSA Papers is the authoritative forum for the publication of original peer-reviewed research furthering the advancement of the art and science of bowed stringed instruments. 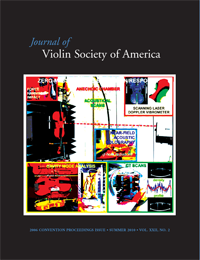 Contents include articles on auctions and appraisals, history of the violin and performers, playing technique and performance practice, making and restoration, tools, varnish, wood, graduation and acoustics. Current issues are published here, one or two times per year. Issues prior to Vol. XXVII are available at vsa.tarisio.com (link). Having trouble logging in? Visit our FAQ for help. Submissions are handled through vsapapers.org, which specifies submission requirements and explains the peer review process. Please contact publications@vsaweb.org with any questions. The Scroll is the membership magazine for the VSA. It is a venue for VSA members to share ideas, research, and news. Each issue of The Scroll will include articles on a broad array of subjects of interest to violin makers, historians, violin dealers, and stringed-instrument musicians. Articles submitted for The Scroll should be 500 to 2,500 words. We're looking for articles concerning all aspects of string instrument making, including building and repair techniques, history, care and maintenance, shop and personality profiles and the business of running a shop. Electronic submission of articles and supporting materials required, as Microsoft Word compatible documents for manuscripts/text, and high resolution jpg or png files for photos and images, and/or high resolution PDF files for tables and other examples. *Note: Do not mail original materials to the VSA office. Any mailed items will not be returned. 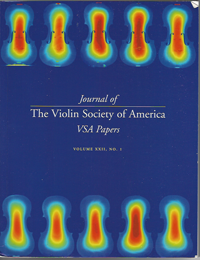 Members may review back issues through the Online Journals of the Violin Society of America. Review table of contents for published issues of the VSA Journal. The VSA office may have other Back Issues. If interested please contact the office at info@vsaweb.org and notify us which ones you are interested in. Review the Table of Contents to determine which to order. 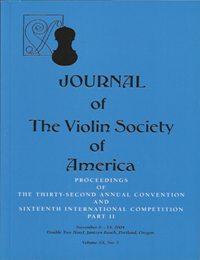 The Catgut Acoustical Society merged with the VSA in 2004. 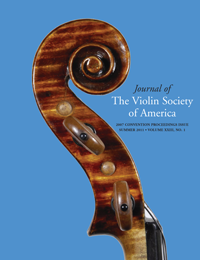 Back issues of all the CAS Newsletters and Journals are all still available, as are the 3 volumes of Acoustics for the Violin Maker.